As I mentioned in my last post, Jesse and I had fairly minimal cooking skills up until the last few years. Thankfully we have been able to find and create some great quick, one pot meals to replace the Hamburger Helper! We also purchased new furniture and the camo couch was forced to live in the "man cave". I may or may not have taken over that space as my home office a short time later.... Poor Jesse. 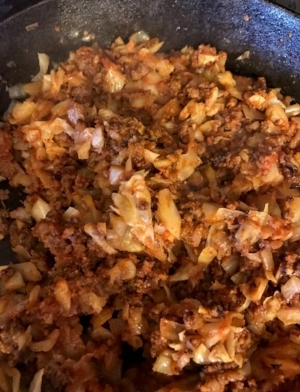 Ground Beef Cabbage Skillet is one of our go-to recipes because it's quick, easy and basically impossible to screw up. I'm not much of a recipe follower... mainly because I get bored with the tedious details of exact measurements, hate dirtying 10 measuring spoons, and have discovered for the most part, exact measurements in dishes like this don't matter! 1-2 peppers, any color would be great. Add a couple hot peppers if that's your thing! 1 can of tomato sauce or 1-2 small cans tomato paste. The best thing about this recipe is that it's super flexible. Don't have any peppers, garlic or tomatoes? Leave any or all of those out and it will still turn out just fine. Want to experiment with additional spices or ingredients, go for it! This is easy to customize. If you're on the fence about whether you even like cabbage - give this a chance. Cabbage is not my favorite, but I love this dish! Step 1 - brown ground beef in a skillet (I prefer cast iron). Add diced onions and peppers so they soften as the beef cooks. If there's any extra fat, drain it off. Step 2 - Add diced garlic and cabbage. Allow to cook for just a couple minutes then add tomato sauce or paste along with salt and pepper. Start with one can of paste then if you need more tomato flavor, add the second. If using tomato paste, you'll need to add about 1/3 cup of water. Step 3 - Stir everything together and cover with a lid. Allow to cook for around 20-25 minutes to allow cabbage to soften. Stir once in awhile and if it's starting to stick add around 1/4 cup of water. How much water you'll need to add depends on the veggies included. Tomatoes and peppers give off lots of liquid, so watch closely if you've left them out! Step 4 - if there's any extra liquid left, simmer for a few minutes with the lid off. You're ready to eat! It's delicious on its own, with a dollop of sour cream or some shredded cheese. Leftovers are excellent reheated the next day. Tastes better than it looks in photos! Have any ideas for other ingredients that would make it even better? ?